Helena Puck Jewelry is an online jewelry store in Wilmore Kentucky. 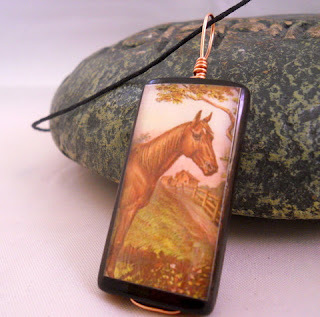 Kentucky is alive with great artisans and this beautiful etsy shop is one of them! I was able to review one of her Bamboo Tile Necklaces. With a Horse on it of course to showcase Kentucky! The mahogany bamboo tile measures about 1 1/2 inches tall by 3/4 inches wide and 1/8 inch thick. The glossy image was decoupaged onto the tile and coated with polyurethane. 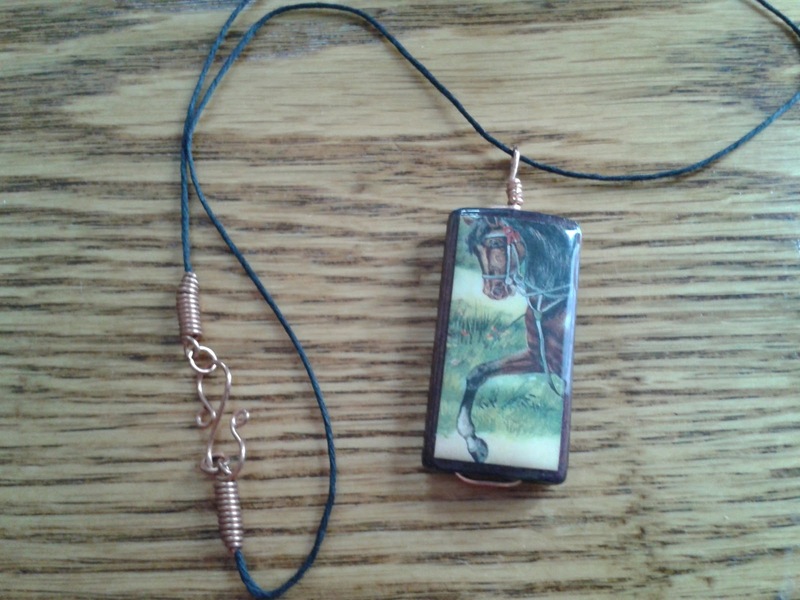 22 gauge copper wire was fed through the tile to create the loop of the necklace. The waxed linen cord measures 16 inches, and around the each end of the cord is a tight 22 gauge copper coil which were created using a coiling gizmo to insure that the coils will be tight and sturdy. The 22 gauge copper jump loops, which was also created using the coiling gizmo, attaches the hand forged S clasp to the ends of the necklace. I wore my horse necklace to church and had several compliments on it! This is horse country after all. Robin Harman can make custom necklaces for you and has a nice selection already listed. If you are a Catholic, she has many gorgeous displays of that faith including many Saints and the Virgin Mary. She also has some darling necklaces for the kid in you! Alice in Wonderland, Peter Rabbit, Wizard of Oz and more. I found this coupon code on her FB page to share with you!! Be sure to like Helena Puck on FB for more great savings. 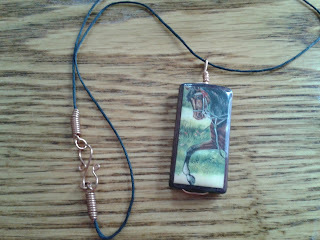 Enter to win your own Horse Bamboo Necklace from Helena Puck!! Blue Enameled Copper Byzantine Chainmaille Bracelet Thanks for the great giveaway! I love the Mary and Baby Jesus wrapped bamboo tile and St. Max! I'm sending a link to my friend who is a missionary for Mitia Immaculata! The oversize cameo chalkboard necklace - what a cute idea! And very pretty too! Oh but I am also really feeling the Hans Christian Andersen's Mermaid Wire Wrapped Bamboo Tile Necklace. Such great stuff here! 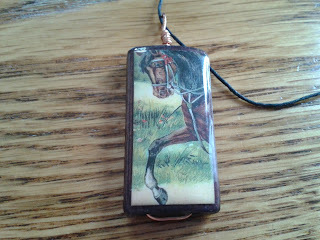 Of course I love the horse ones, as a lifelong equestrian! But Edgar Allan Poe is awesome, too! Such beautiful work! I think the Claude Monet Water Lilies Bamboo Necklace is my favorite! 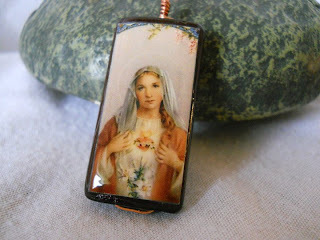 I like the Our Lady of Fatima Wire wrapped Bamboo Tile Necklace. I like the Gamer Dice Box Wire Wrapped Bamboo Tile Necklace. Thanks. I would have to say the bamboo puck necklace in the horse. My daughter loves horses and she would love this. I really love all of the Beatrix Potter and vintage Alice in Wonderland necklaces! 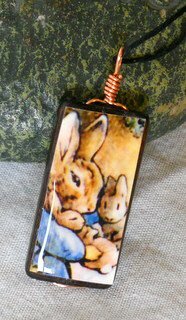 I would get the Peter Rabbit necklace for my daughter who loves her bunny. I really like the Emily Dickinson wire wrapped pendant. I like her bamboo tiles. I ask her to customize with a cat. I like Alice in Wonderland and Wizard of Oz. So many cute choices!! Autism Awareness Bamboo Tile Necklace is my favorite! I like the Adjustable Wire Wrapped Copper Cuff. This necklace is beautiful! I also like the Translucent Blue Glass Quartz earrings. I like the Back to School Oval Chalk Board Necklace! I like the Blessed Mother with Lamb of God Bamboo Tile Necklace. I love the Edgar Allan Poe Bamboo Tile Necklace! In fact, I'll probably order it for my daughter! They are all SO pretty it would be SO hard to choose! I love the face of jesus one. I like the Tetris Video Game Bamboo Tile Necklace! The Back To School Oval Chalk Board Necklace.